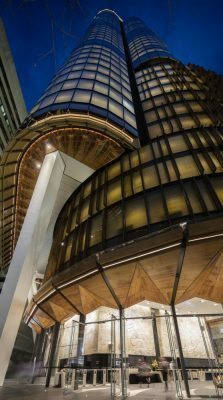 Mirvac and FJMT Studio’s recent tower at 200 George Street heralds a new era in high rise building design, particularly in an Australian context. 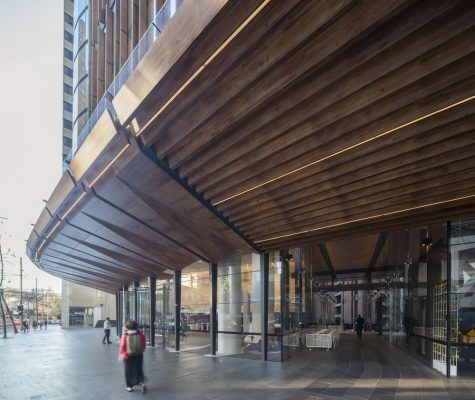 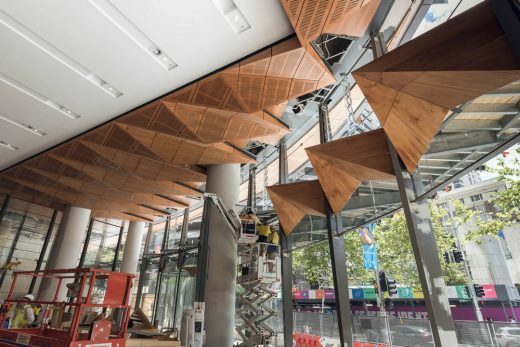 Employing a novel timber-and-glass façade system, the building seeks to better integrate sustainable design within commercial architecture, providing Sydney with a new aesthetic and environmental standard. 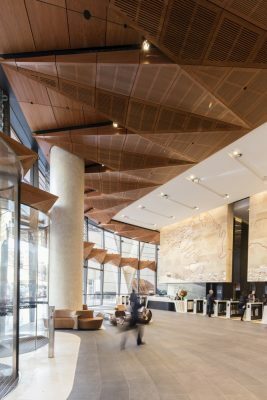 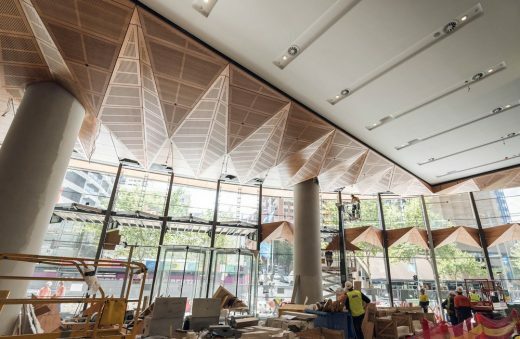 AR-MA was engaged by Mirvac as part of a specialist façade team to manage design and construction of the podium glazing and cladding. 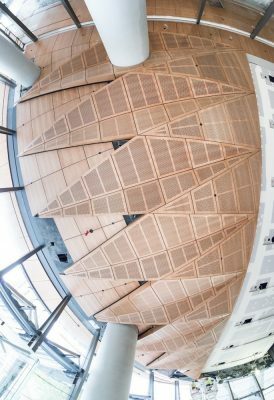 This team also included ARUP, who managed structural engineering, and Empire Glass and Aluminium, who managed fabrication and installation. 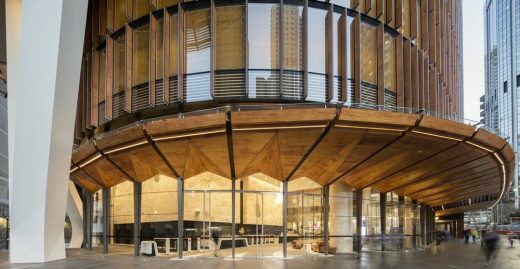 Working within this team, AR-MA was able to efficiently rationalise the design intent of the architect into an efficient and buildable system incorporating the latest in design technologies. 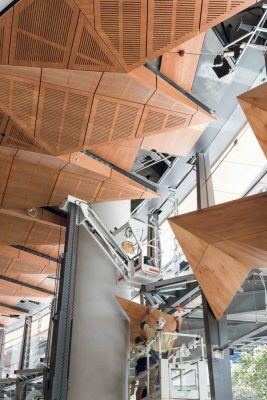 Throughout the project, AR-MA maintained parametric design and fabrication models for all areas of their scope. 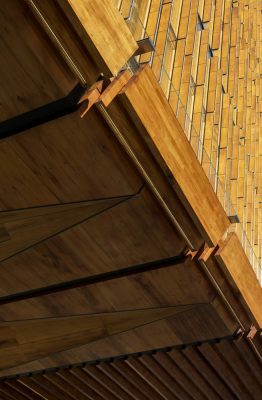 This allowed AR-MA to move the design outside of conventional building methods and proprietary products, and enable massive customization to produce a highly specific, intentional, and bespoke architecture, satisfying the architect’s intent and the realities of building. 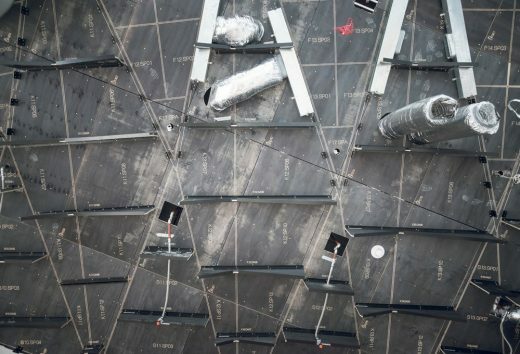 Rather than producing traditional drawing packages to outline construction and site installation, AR-MA worked directly with fabrication subcontractors in order to produce direct-to-fabrication, for-manufacture packages. 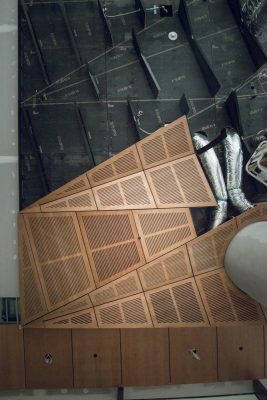 These packages were used to produce highly complex building components within tight tolerances, in a manner not possible on site. 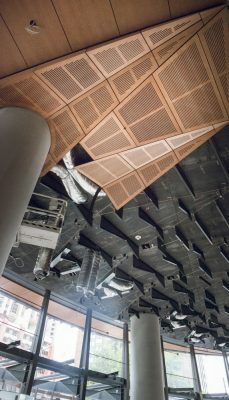 To further reduce the number of drawings required, installation instructions were integrated within these factory-fabricated by milling labels and set-out lines into the components in the factory. 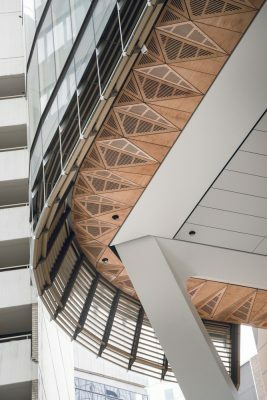 This agile manner of working allowed AR-MA to achieve high levels of geometric complexity in all areas of design, and quickly respond to any issues encountered on site. 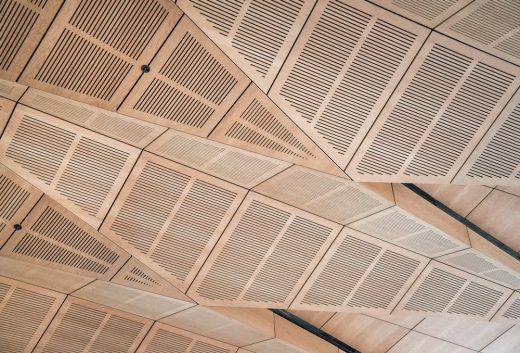 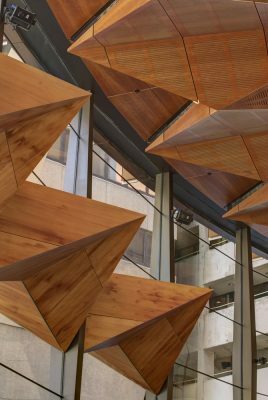 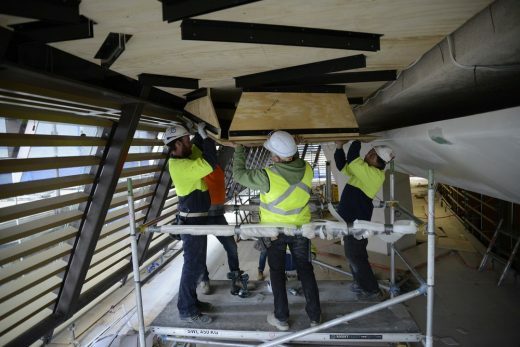 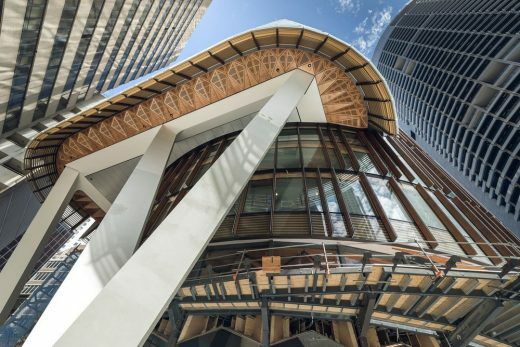 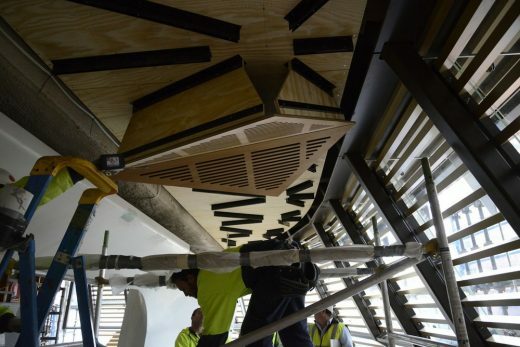 Over 550 panels of shaped, frameless glass and 1954 5-axis CNC-routed timber panels, fabricated in either glulam or Australian hoop pine plywood were designed by AR-MA for the building. 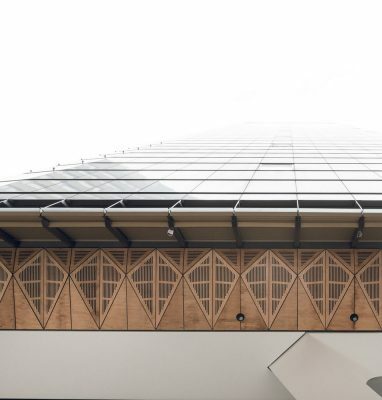 AR-MA’s consultancy allowed Mirvac and FJMT Studio to realise their highly ambitious and sustainable tower at 200 George Street, providing Sydney with a new standard in contemporary high rise design.